﻿Sitting can be a pain. Literally. And for workers with pain caused by back, leg or hip injuries, sitting for long periods can be excruciating. This is why we are seeing more and more workplace initiatives encouraging mini-breaks away from the computer throughout the day. The use of ergonomic office equipment for staff who need it, such as a sit-stand workstation, is also becoming more common. Christine Cheston, a health safety and environment administrator, knows first-hand how prolonged sitting in the workplace can have a negative impact on morale and productivity for workers. Cheston shares the story of a woman who has been using a sit-stand workstation and who, in just a short time, has already found a difference in her overall pain level. For employees who can’t sit for longer periods of time, a sit-stand workstation can be beneficial. But Paolo Naccarato, the ergonomics consultant at WCB’s Millard Health, says it’s important for all workers to make a point of moving around regularly throughout the day, even if they don’t find sitting uncomfortable. So take a stand (and walk) for your health—your body will thank you for it. We've updated our site with more healthy back tips and facts. Learn more about simple ways to protect your back every day! Cargill participates in Take a Walk day. Walking the walk. Safety association gets behind back health initiative. Take a Stand. 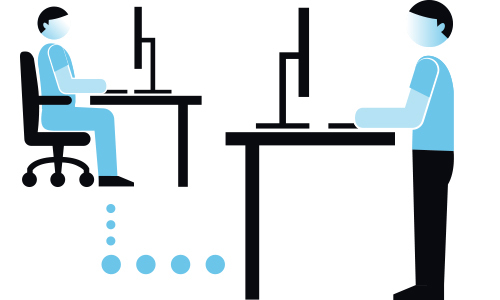 Why sitting too much can be bad for your health.